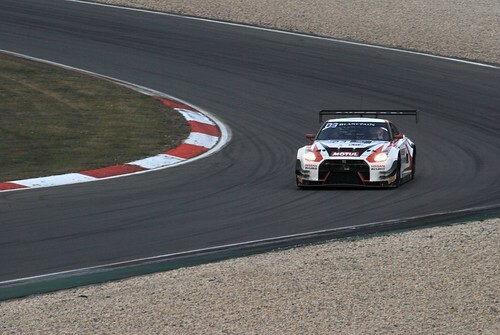 On 2 February I drove an Aston Martin GT3 race car on the VLN set up on the Nürburgring. The catch is that I never left the UK. I went to Base Performance Simulators in Banbury to see for myself what driving in a simulator is like. And it’s a lot harder than you may expect. When I called I simply requested an Aston Martin (what else?) on the Nordschleife. The reason for this is that, as you may know, I have done one lap of the Nordschleife in the Ringtaxi. At the time I felt I wouldn’t want to drive there myself, but – as it happens when time passes – I have change my mind and now would like to try. 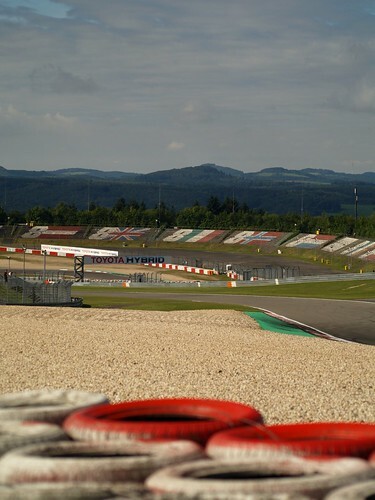 However, the Nordschleife is a notorious track and I am not confident enough to take it on at this moment in time. So when the opportunity arose to try a simulator session at Base Performance I took it with both hands. When I got there I was introduced to my instructor/coach, Dave, who explained how the simulator worked. He also told me the simulator had been set up as a GT3 Aston as these are easier to drive than the GT4. I was thankful for that pretty soon! It’s interesting to be told your feet are too small. I usually don’t have any issues with my size 6 feet, but apparently I would have a bit of an issue braking because my feet didn’t fully cover the pedal. Dave turned out to be 100% correct: I had to put more of an effort in than people with bigger feet and eventually resorted to moving my foot so I pressed on the brake pedal a bit higher. That certainly made it easier. The first surprise came when the session started: having three screens made me seriously dizzy. Dave had to switch the two side screens off to make it even bearable. This meant that I lost my peripheral vision, which is not ideal when going through corners. It took me approximately one lap (which is rather large!) before I managed to deal with the vision. I have to admit it never did go normal, there was always a bit of an effect, but it didn’t hamper me…thankfully. My second surprise was how heavy the steering wheel was. Even though the Aston has power steering the tyres would be big and have no profile (slicks, as these are called). I hadn’t taken that into account, of course. At then end of the session my arms were quite tired. I am not particularly short (1.70m), but the position within the car is quite low. As a result I couldn’t see the track at all when going uphill. Very interesting, as you will not know what’s coming next…unless you know the track very well, and I don’t. I also kept on crashing in the same corner. The reason being that I approached it while driving on the right side of the track and this was a righ hand turn. As a result I turned in too fast and too sharp and skidded nicely to my left into the armco. Oops! Even though I couldn’t see the track until very shortly before this corner, I don’t want to use that as an excuse. After a few laps I knew it was coming and I made the same mistake every single time. I believe I managed to just stay clear of the armco, but was still on the grass. I need more practice. All in all, it was a great experience and I am considering repeating it. One or two motion sickness pills should help with the nausea, so I can use all three screens. And I intend to do my homework and study the track before any future attempts. I managed 4 laps and went from 12:29 to 10:40. My aim is not to drive one lap as fast as possible, but to get an idea on how to drive that track safely. Chances are therefore quite high that I will try another session so I can eventually move on to learning to drive there in a real car. Watch this space! Only last year did I discover Blancpain and I am already hooked. So much so that I went back to the Nürburgring (second visit this year) to see the Endurance Cup finale. If you follow this series you will know there is a very large number of cars on track. There is huge variation in cars and the action never stops. Additionally, the races are never predictable. Anything can happen and will happen, often in the last minutes. Practice happens before all the action, early in the morning. I have a habit of arriving early at the track, but usually not before all the action starts. This time I had a hotel a few minutes walking away from the track, which meant I got there around 8 in the morning. I never realised the marshalls have practice time! The safety car, medical car, etc. all head out on track while the marshalls go through all the options: yellow flag, safety car, red flag, etc. During this weekend I also heard that the marshalls should be able to see to the marshall station before and after them. Due to very heavy fog on Sunday they most certainly could not. As a result Q1 and Q2 for Blancpain were cancelled. At times the fog was so heavy I could not see the track at all from stand T4 (which is at the end of the pit straight). Quite a contrast with Saturday when we had lovely weather. Hugo de Sadeleer during the Formula Renault 2.0 NEC race on Sunday morning after the fog cleared. 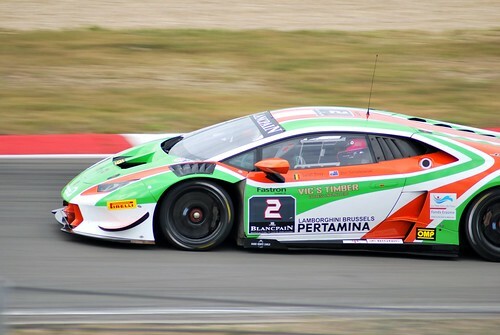 Another supporting race which I have mentioned before is the Lamborghini Super Trofeo. Like Blancpain this series has a large grid. There were 40 cars in total. That’s 40 Lamborghini Huracans. That’s a lot of horsepower! The Huracan just looks great as a race car and it’s mighty fast. With a field that large you’re guaranteed to have a lot to look at. I watched the Lamborghinis from T3 (which is along the pit straight) and saw a lot of very close racing. Roughly translated that means the drivers tried to fit as many cars through that one hairpin as they possibly could (or couldn’t, as the case may be). Just imagine a number of Huracans speeding down the pit straight as fast as they can, then braking hard trying to prepare for that sharp corner, but then four or five simultaneously. It just doesn’t fit and some had to pick something other than the ideal racing line. The Lamborghini Huracan of Leipert Motorsport. Being at the track for the entire weekend means I could admire all that horsepower, regardless which series they appeared in, for two full days. Unfortunately I also saw the #7 Bentley crash at the end of the pit straight during practice. It was a sickening, very loud thud. The moment the marshalls started to cover the scene your heart sinks. Thankfully Steven Kane, who was driving at the time, was declared fit shortly after. Even better: Bentley had been running some tests in Spain and “commandeered” a car which arrived on time to race on Sunday. Of course I wouldn’t be me if I didn’t mention Aston Martin. 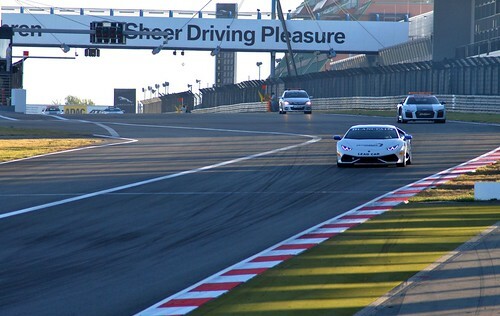 There is only one participating in Blancpain this year – Oman Racing. After putting the car on 6th position (overall, first in class) during qualifying they were unceremoniously pushed off track shortly after the start (that damned hairpin again!) and spent the rest of the race trying to catch up. It was a tall order and they never got close to a class podium. But hey, that’s racing! I still thoroughly enjoyed watching the Aston chasing the other cars in its class. I was lucky enough to see a few beautiful overtakes (not only by the Aston, mind you), so there was enough to keep me happy. The #23 Nissan GT-R Nismo GT3 exiting a corner. Like the previous races, whether I was there at the track or watching them on television, this race had it all: close racing, some scraps, cars breaking down, teams having to catch up. Non-stop excitement for three hours. Unfortunately that was it for this year. Rest assured, I will be back to witness another year of Blancpain Endurance in 2017. Going to Nürburgring last year was a spur of the moment decision I never regretted. It was quickly decided I would go again this year, this time with my best friend. Despite the weather (either very hot or very wet) we were not disappointed. We got there early on Friday morning and spent the morning in the paddock. As usual not that many people go to the track on a Friday, so we had plenty of room to ‘loiter with intent’, as we call it. That means you hang around near either the hospitality tent or the box of your team of choice, hoping to catch a glimpse – or, even better, a signature or selfie – of your favourite driver(s). With the WEC drivers being such a friendly bunch, that was not very difficult. At noon free practice 1 (more commonly referred to as FP1) started. Even though everyone knows you can’t really tell anything from practice sessions, everyone keeps on looking at the times and speeds. FP1 saw Aston Martin Racing hold its own very well: second and third fastest in GTE Pro and fastest in GTE Am. After Le Mans the BoP (Balance of Performance) regulations had been changed slightly, this time in favour of Aston Martin Racing. It was certainly good to see the Astons perform well overall. The #97 Aston Martin during FP1. With four classes on track it is absolutely no problem to support more than one team. This year we are also supporting newcomers RGR Sport, the Mexican team which has Bruno Senna on board. During the public test day in France (Circuit Paul Ricard) it became very clear that all three drivers are very friendly and approachable. They also showed enormous enthusiasm, clearly ready to start their first season. 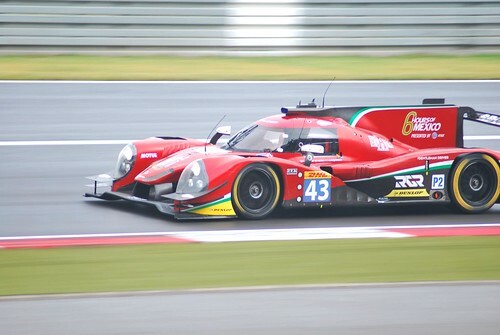 They were ready: they won in their class (LMP2) in the first race at Silverstone. During FP1 at the Nürburgring they were sixth fastest, nicely in the middle of the 11 competing teams. We stayed the entire day and also watched FP2. During this session RGR Sport ended up seventh fastest, Aston Martin Racing first and fourth in GTE Pro and fourth in GTE Am. 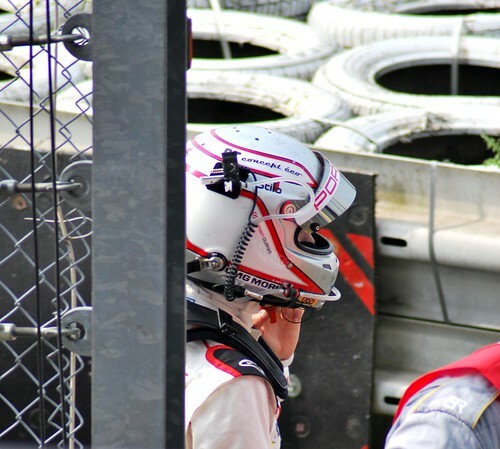 Romain Dumas’ Porsche suffered a brake failure, which caused him to crash – very close to where we were sitting. Thankfully he was ok, but the car did not come out again during this session. Romain Dumas was unharmed after his crash during FP2. On Saturday we were back at the track early to catch FP3. However, the weather gods decided otherwise. Rain and some wind caused issues for the medical helicopter and the practice session was delayed for 45 minutes because of this. With the track still wet anything could happen. There was some sliding going on, but a bit of water won’t stop WEC drivers. RGR Sport were once again seventh fastest in their class. 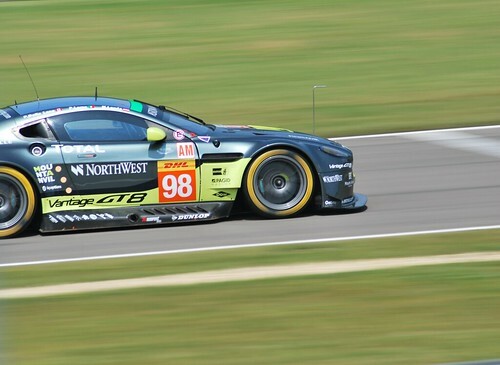 Aston Martin Racing didn’t fare as well as on Friday: fourth and sixth in GTE Pro and fifth in GTE Am. Considering the mixed results in three practice sessions for only four cars (RGR’s LMP2 and AMR’s three GTE cars) it goes to show that practice really doesn’t tell the observant WEC fan anything. To be honest, we only watch these sessions because we enjoy seeing the cars out on track and especially hearing them. It doesn’t get exciting until qualification. The #43 of RGR Sport. First qualifying session was for the GTE cars (Pro and Am). The track was still not entirely dry, so it was no surprise the positions kept on changing until the very last car crossed the finish line at the end of the session. We were two very happy fans, though, as Aston Martin #95 took pole position in GTE Pro followed by #97 in third position and #98 was to start from third position in GTE Am. The sixth and seventh positions RGR Sport got in the practice sessions were turned into a respectable fourth during LMP qualification. All in all a good result all around. The pit walk for Sunday was moved to an earlier time and, surprisingly, was open to everyone. Last year pit walk tickets were sent out, but it seems no tickets were checked at the gate. Seeing how busy it was then I expected it to be even worse this time around, but it was actually reasonably quiet. This may be due to the earlier time of 09:00 with the autograph session starting at 10:00 instead of 10:30. To celebrate RGR Sport’s maiden win at Silverstone I had brought one of my photos of the #43 to be signed by all three drivers. After that we made our way to the Aston Martin Racing boxes where it was very quiet compared to RGR’s box. 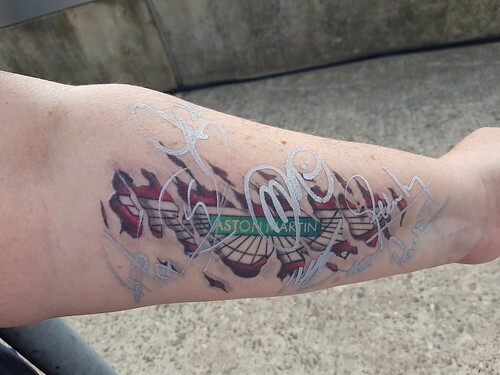 This did give my friend the opportunity to have her Aston Martin tattoo signed by all AMR drivers, some of whom wondered if the image was a transfer. Errr….no, it isn’t. The ink has now been washed off, but the photos and memories remain. The ‘no, it’s not a transfer’ tattoo with signatures by all Aston Martin Racing drivers. Saturday’s rain had disappeared and instead we had sunshine, lots of it. I believe the temperature was mostly around mid twenties. Sitting at an uncovered grand stand was therefore rather hot. The action on track didn’t help in that respect. At 13:00 the race started and the action simply never stopped. In LMP1 the Audis had secured both front row spots during qualifying, but they didn’t hold on to them for long. Porsche had a very good race and managed to keep both Audis behind them. 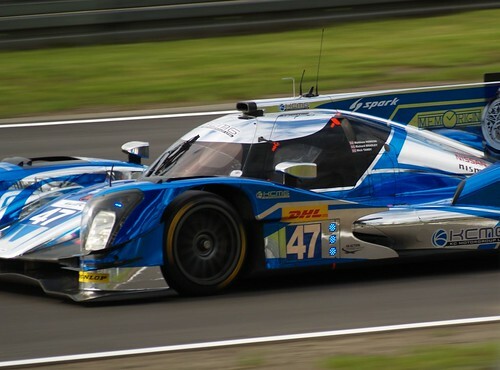 In LMP2 our attention was firmly on RGR Sport. They fell back considerably early on in the race, which meant catching up was required. I don’t want to say anything bad about Ricardo González or Filipe Albuquerque, because they are both good at what they do. But catching up is what Bruno Senna does best and boy, did he do just that! At the end of the race RGR Sports finished in second place, two laps ahead of number three. The #97 Aston Martin literally ran into some trouble; or rather: they got bumped by a LMP2 car. They lost a lot of ground due to having to pit for a new door (even though only the wing mirror was damaged). Richie Stanaway and Darren Turner gave it their all, most of the time going faster than their opponents, but they never made it further than fifth. The #95 had its own problems. Initially Nicki Thiim managed to build up a 15 second lead over the second placed car, but eventually couldn’t hold of the competition. Lady Luck was especially harsh towards the end of the race. Very close to 18:00 the #95 pitted for the last time. Mere moments after that pit stop a FCY (Full Course Yellow) was issued to remove some debris from the track. That means ‘free’ pit stops for anyone who wants them. That worked beautifully in favour of the other teams and the #95 fell back to fourth. Thanks to a penalty for Ford the Dane Train still made it onto the podium in third. 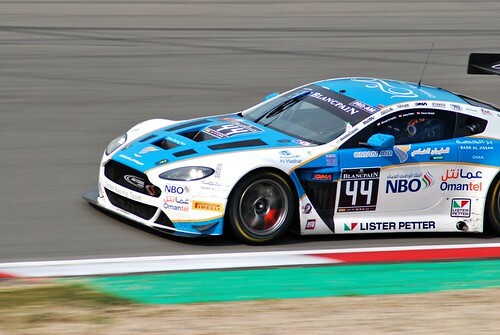 It was later confirmed that on average Nicki Thiim was the fastest driver on the day. In GTE Am the #98 was doing rather well. At first it seemed they were struggling, but eventually they made it to first spot and stayed there. The team drove an exceptionally solid race. Of course there is much more going on than the trials and tribulations of RGR and Aston Martin Racing. Like at Silverstone a LMP1 Porsche and a GTE Porsche came together. The LMP1 was worse off and had to pit for some quick repairs. The most heart breaking moment was probably when the #4 ByKolles (LMP1), driven by Oliver Webb, had to retire with technical issues. Somehow it’s always hard to watch a driver’s disappointment when they cannot finish the race. It may not have been as dramatic as what happened to Toyota at Le Mans this year, but the disappointment seemed to be as great. 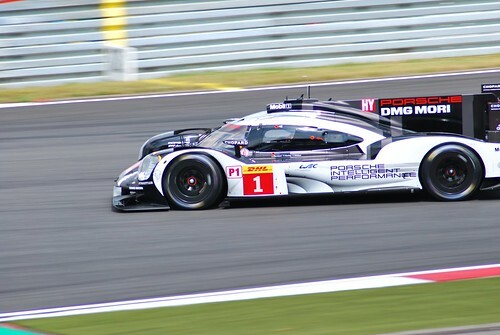 The winner of LMP1: the #1 Porsche. And that is part of what makes WEC so fantastic for me. There are so many teams and drivers, so there are as many different fans. But it makes no difference who you support. I think everyone wants to see all teams finish and there is sympathy for whoever has bad luck and concern for whoever crashes. In the end we all cheer on our team(s)/driver(s) of choice, but without the other teams we wouldn’t have a race. And that’s what it’s all about. 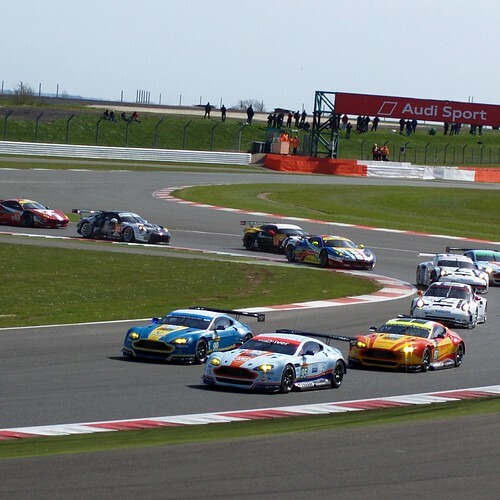 The weekend of 29 and 30 August saw WEC land in Germany for the 6 hours of Nürburgring. I had made up my mind to go months earlier. With Aston Martin Racing being my favourite team, the #97 my favourite car and Darren Turner my favourite driver, I decided to add a bit of fun to my already brilliant weekend. So before going I asked the cheeky question: would he have a few moments for a quick Q&A? Remarkably, Darren found time for me in an undoubtedly busy weekend and he very patiently answered all my questions. AGWLC: On your website there is basically no information from before 1996. What did you do before then? DT: What did I do before that? I did karting, but just club level karting with my dad. We got an old transit van and it was just father and son, something we did at the weekends. Not every weekend; we went racing maybe 10, 12 times a year. It was very much me running the car; prepping the car. In fact, I enjoyed that as much as the racing. Go away for the weekends, do a bit of racing, coming home and it was never thought there could be a career from driving cars. It was literally a hobby and an ideal chance for me to learn some skills about working on race karts The idea was to work in motor racing and become a mechanic. So it was perfect. It was only later that things started to be a little bit more of ‘actually I could do alright with this, I could have a career’ and hopefully jump from working on them to actually race them full time. That was 1992,1993. And then in 1993 I did Formula First. Did half a season running my own car and then did the winter series. In 1994 I did half a season of Vauxhall Lotus and then ’95 and ’96 I did Formula Renault. I was always very lucky that I’ve met some very, very important people in my career that wanted to help me. Either they were financial backers or they just made things happen for me. The turning point was coming second in the Formula Renault championship and winning the McLaren Autosport BRDC Award at the end of 1996. That was the real turning point for me, actually having a chance of being a professional driver. Darren during the signing session at Nürburgring. AGWLC: Was that then the moment you decided that was what you were going to do rather than the technical side or did that happen earlier? DT: I don’t know if it was ever a clear cut decision. Because if you’ve got no financial backing or financial resources privately, from the family or anything, you can’t choose what your career is going to be. It’s going to happen from other people who would like to see you move up the ladder. So that was the crux of it really. Winning the award in ’96 meant that I had a test with McLaren at the beginning of ’97 and effectively they took me under their wing. They put me into DTM at the beginning of 2000 and 2001 and that was really the turning point: winning the award and being with McLaren and then McLaren taking me under their wing and giving me work from 1997 onwards. It was the turning point of being a guy that wants to be a professional racing driver to being a professional racing driver. And I never really looked back after that. This industry is very much a case of: if you work hard and you meet the right people and you make the right impression and people want to help you, things can happen. There’s quite a lot of drivers that have had that happen for them even though they don’t have the big resources or finance to get them to the top. The fact is there was never a plan and we’ve just gone from one season to the other and, amazingly, I’ve ended up with a career from being able to drive fairly well up to the level that is required to be a professional. I was very fortunate to be with Prodrive in 2003 and then that went from a privateer Ferrari programme to a works Aston role. I’ve been there ever since. AGWLC: You just said there never was a plan, but you seem quite happy with Aston Martin. Is that what you want to keep on doing? DT: It’s one of those things. It’s a great brand to be with; certainly as a British driver being an Aston Martin driver is fantastic. And also the programmes they’ve done. GT1 was amazing. Then they did LMP1 and that was a great challenge with the Lola Aston. 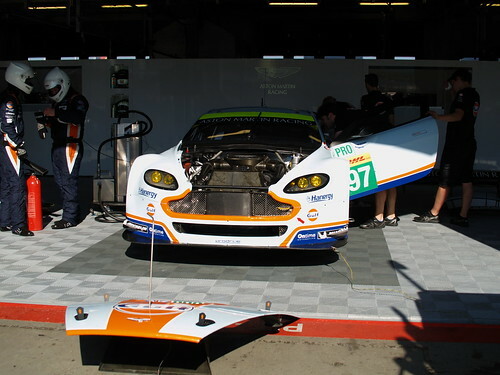 Then with the AMR-One and then coming back to GT racing with the GTE programme. So there’s never been anything that hasn’t been of interest and the programmes are always good. The team’s fantastic, very small team compared to some of the bigger manufacturers, and they always punch very much above their weight. So I’ve been happy. There’s been other opportunities and other possibilities as well. But you look at it and – it has even happened this year – you put all the facts of what you get from one team and one manufacturer, what’s on offer from another team and manufacturer. Sometimes it could be more money or it could be less days, there’s always a benefit, there’s always a positive and a negative for each of the situations and scenarios. I’ve always looked back at it and go: I’m really happy here. It’s local to me anyway, I’m on the doorstep from the team and, as a guy that’s been with them for now 12, 13 years, it’s a long time. I’ve got another three years extension on my deal, I can see the end of my career with the manufacturer and that’s really important with the next thing that happens after. There is a point where you stop driving. You’re no longer competitive and there’s a natural point where you’re saying: I’m going to hang up my helmet and still maybe race some things for fun, but you’re not out there as a professional. And for me it’s important to have that brand association, moving forward, because it just opens up other opportunities for the future. 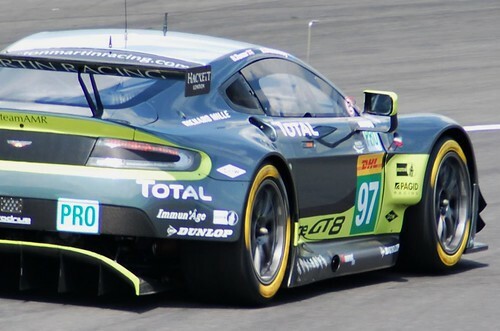 The #97 Aston Martin in action during the weekend in Germany. AGWLC: From the press release it seems more is added to your role outside of driving already. Do you expect that is the way it’s going to go after you stop driving? DT: Yes, very much so. I’m involved with the new Vulcan programme. I’m just coming from Italy from 10 days of that and there’s going to be more programmes like that in the future and that’s what the brand association is. You build that so you become part of the team that looks after the customers that are buying the road cars and you become part of that package. AGWLC: You have been involved with the development of the Vulcan. Does that also go back to your interest in the technical side or is this something which evolved through time? DT: The Vulcan is a new project and it’s from the road cars, not from the race team, but it’s got race team involvement. They know it’s going to be a track day car so they wanted the experience of people that drive – it’s not a high performance road car, it’s a high performance track day car – big, big difference. And that’s where my experience came from and I got involved with the designers. I’m not saying what they should do, I’m just giving an opinion of what it should be like from the driver’s point of view and then they come back with the design and the concepts. Sometimes you sit down and go ‘that’s amazing’. And a lot of the stuff they come back with you would never have imagined doing it like that and that’s why I drive cars and they design them. It’s basically been a very exciting project to be involved with. There’s still quite a lot of work to do before the cars get to the point where we hand them over to the customers. That’s all the fundamental testing to make sure it’s reliable, it performs well and it gives the customers the experience that we hope they enjoy. Even today I’m getting updates. There’s two younger drivers pounding around in southern Italy today and I’m going back and join them next week. It’s been an interesting 8 to 9 months with that project. AGWLC: It sounds like development continues until the very first car rolls out. DT: The prototype car is actually the first chassis as well. So it is a customer’s car, but they want it to be used as the prototype. I think, the customer cars will be handed over February next year, but by then we will have gone through all the procedures we need to make sure it’s the definitive finished article. AGWLC: And when the customers start picking up their cars will you also be involved in teaching them how to drive them? DT: Yeah. There’s a group of us. So initially I’ll be demonstrating the car in the next couple of months to the customers and the potential customers as well. And then there’s a group of us that will be part of that driver/coach element to bring them up from performance road cars. Effectively it’s sort of like a GTE/GT3 car, so it’s got that sort of performance. It’s not something they can just get in and drive straight off and be able to get the full potential of the car. There’s a gang of us that will be there to help them go through that learning curve and get higher up the ladder of performance the car is capable of. During the pit walk the cars are on display, but work doesn’t really stop. AGWLC: I understand you are also involved in the programme Aston Martin Racing runs for people who’d like to get their race license? DT: A little bit, yeah. Aston Martin Racing has done it with a few drivers recently. I have my own simulator company [Base Performance Simulators], so they come to me first for a bit of a look-see, to see what they’re like. Because some of them have got no racing experience. And then we give them a bit of a programme. I do the very initial thing and then probably go do a track day with them to see what they’re like and they end up going with one of the teams that are running GT4 cars and they gain their experience there. But I’ve certainly seen quite a few on their first few days and it’s important just to give them the right sort of direction. And also the right sort of time frame. They have to go through a programme. It’s not like they can just jump from doing nothing straight into a GT3 and expect to do a good job. They have got to go through that learning curve and I think that’s what Aston Martin Racing does very well. Start you off on a step one, give you all the tools to be able to move up to step two and build your confidence. At no point is there a backwards step. The worst thing you can do with drivers is throw them in at such a level that they end up making loads of mistakes. It’s costly, because they’re expensive cars to run and repair, and then they lose their confidence and they’re not coming back. From that sort of side I think the programme that Aston have got in place, the racing side, is very good for people that come from zero experience. AGWLC: The way it’s been described on the website the programme is in three very clear steps in what seems to be three days. Can it happen it will take more time? DT: It’s tuned to the individual. There is no guarantee that someone will get in and have the natural ability to drive a car well and it all depends on their actual background of experience of road cars etc. So you just have to go through it at the pace that fits that individual. Some people pick up very quickly, some people just take a bit longer. I’ve got a similar experience. I’ve learnt to fly about 8 to 9 years ago and the actual flying side was easy. It’s just controlling a machine. It’s very much similar to what we do. But obviously what we’re doing is pushing to the limits and the edge of the performance of that vehicle. Flying is the opposite. It’s being well within the envelope of the performance and to be safe. So that was a little bit of a thing to learn but there are so many other elements and procedures and radio communication and navigation and all that stuff that was out of my comfort zone. From that point that was a longer process than learning to fly. The plane, pretty much, three hours of flying, yeah, I get this, I know what I need to do. And all the other things were the elements that took me longer. You could take another person with zero flying hours and they would take twice, three or four times as long as me to get used to flying, but pick the other stuff really quickly. So everyone is different and you just tailor it to suit. AGWLC: Did anyone ever quit half way, because they just couldn’t do it? DT: I’ve not experienced that. I think most people just want to get to the stage where they can safely say they’ve done a couple of races and they’ve got past their rookie stage. And also, most of them, once they’ve got the bug bitten, they’re in for the long haul. Until bank accounts or family or something means that they need to stop for a bit. The race at Silverstone earlier this year saw the #97 in different colours. AGWLC: Currently in the media, regardless of which series of motor sport you watch, there is a lot of talk about the teams, but hardly about the driver. So my question is: what makes someone a good driver? DT: Being part of the team. [laughs] The level of driving is generally high and there’s more people at that level. A lot of that is because there’s so much data available now and there’s a lot more science behind it. You can educate yourself more. Gone are the days where it was all down to the driver having great car control and being a natural racer, which means he’s always going to be on top of the tree. Now there’s so many things available that a lot of people can get to that level. I think being a team player, being consistent, being able to deliver week in, week out and over a period of a year being able also to deliver over that whole period. And an understanding of the individual element of what makes the team tick. There are some drivers that are fantastically fast on the track, but they don’t look at the bigger picture. Then they make more mistakes and they might damage the car; that puts the development behind the programme. All those elements, especially in sports car racing and at a professional level, will have a knock on effect. So you have look at it and say ‘well, I’m just another cog in this big mechanism that is the race team and I’ve got a job to do. No more, no less, and if I do my job at a high level then that’s my contribution. We’re not going to win races if we’ve got the slowest guys on the guns on the wheels, so every part of it has to be up to the high standard and everyone has to be highly motivated to make sure that these race weekends they bring their best game. Because that’s the only way you’re going to beat the next guy down the pit, within your team and then the competitors from the different manufacturers. AGWLC: I get the idea that for Aston Martin Racing this is mainly within the team. There’s a lot of first, second and third places for them. DT: It’s a strong team right now. There’s the younger drivers coming through with a lot of experience and speed and the team’s growing and growing, certainly in confidence as well. 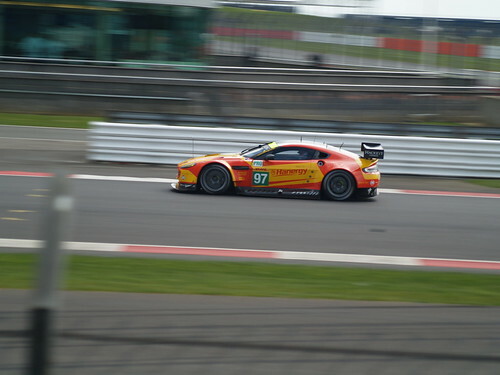 At the start of the 6 hours of Silverstone Aston Martin Racing had placed themselves on the first three spots in GTE Pro. 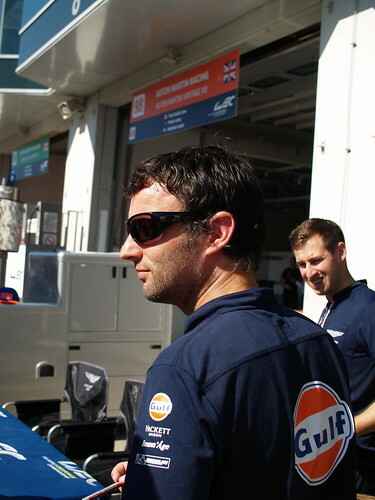 AGWLC: I have noticed that at Aston Martin Racing there are five cars and usually fourteen drivers. Why are there – apparently standard – only two drivers in #97? DT: It changes really. Normally pre-Le Mans we always run a third. We have Jonny [Adam] in there now for the rest of the season; more of a chance for him to get the experience to be part of it full time next year, possibly; to see what he’s like. The ideal scenario is you only run two drivers in a car. It’s not the same for the AMs. The AMs have to run with three, but in the Pros, you look at the Ferraris and the Porsches, they are all running two drivers. But this weekend #95 is running two, because Nicki [Thiim] is away. We’ve got three, because we’re trying to get Jonny the experience he needs. Because Aston Martin is such a small manufacturer the financing of a team like this is not as straight forward as the big manufacturers. So things have to happen and that means sometimes you have to compromise the absolute best scenario to cover all the bases. Sometimes you have to run three because of the way the budget works etc. AGWLC: Why is two the optimum scenario? DT: Because at a six hour race you don’t need three. It’s only three hours, so you can do hour on, hour off, hour on, hour off. And also with the testing time up to it [the race], sessions one, two, three, they get diluted with a third driver. It does just mean you get less track time, so two is always the optimum on this type of weekend. AGWLC: Completely different question: have you ever driven a One-77? DT: Yeah, Jan Struve, one of the car owners for the #95, he’s got a One-77, so he kindly let me have a little blast around. AGWLC: Can you even compare the One-77 with the Vulcan? DT: Oh no, it’s totally different! It’s a great road car and I didn’t take it out on track, I took it out on the road and really enjoyed it, but the Vulcan is something completely different. Absolutely. It may have it’s heart within the One-77, but after that there’s not really much similar between the two. AGWLC: What do you think is your biggest achievement professionally? DT: I think being a professional driver. It’s funny. It’s such a hard industry to be successful in and to have a long career. I’ve pretty much been a pro since the beginning of 1997 when I got my first cheque for driving a race car. And that’s now 18 years of being paid to go racing, amazingly. I look at it as a whole, rather than a single element. But from a racing point I’d say winning at Le Mans in 2007 and 2008 are the stand out events that I’m most proud of. With Sao Paulo disappearing from the WEC calendar this year a different location had to be added. And boy, am I happy they decided to go to Germany! Of course it’s awfully convenient to hop over to Germany from the UK, but there is something about that name: Nürburgring. I was fully aware they were not going to race at that part of it. Nevertheless this was a trip I was looking forward to for months. On 28 August the day finally came that I flew to Düsseldorf and from there I drove straight to the track. Throughout the weekend the weather was amazing (read: hot!) and I found several brilliant spots to view the action from. I think in most locations you’ll be able to see several sections of the track. One of the things I found unusual is that the complex is for a very large part open to the public. With there being a cinema, shops, a kart track and more it makes sense to ensure people only need a ticket for a race. The stands were behind ticket machines and fences, everything else is freely accessible. In addition, there are areas of the track you can reach by simply driving there and having a look through the mesh fence. I did get the idea those areas may be part of the Nordschleife, but I didn’t give myself the time to fully investigate. On Friday afternoon it was nice and quiet. Not that many people decided to show up. In my opinion you miss out if you only go for weekend or, worse, only on Sunday. The atmosphere was calm, the weather helped put people in a good mood and there was still lots to see. It’s also a wonderful opportunity to walk around and get acquainted with the track. I even made my way to the paddock, because I had a pit walk ticket for the Sunday. I ended up staying until the very last part of the programme – practice 2 – had finished, so I certainly made the most of my day. One of the photos I took during practice on Friday. Saturday was another busy day on track, so I spent my day trackside as much as possible. I managed to get some nice photos of the Porsches going round and of course the so-called Legends of Nürburgring. Being a car enthusiast it was a real treat for me to see some older cars race. The fact that the ‘Legends’ were mixed up, rather than put in neat classes, just added to the fun. 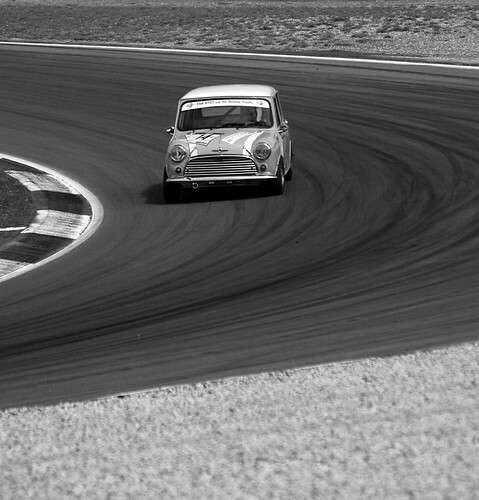 There was one classic Mini which gave chase to some newer and much bigger cars! Entertainment value 100%. This one really is a Mighty Mini…it was quick! Sunday was of course the main thing: the race from 13:00 to 19:00 local time. But before that I joined several thousand people for the pit walk. I’ve only been to one other pit walk: in April before the 6 hours of Silverstone. That was busy…in Germany it was busier. I wouldn’t be surprised if that was due to the fact that there were 8,000 tickets available and they didn’t check the tickets. In theory anyone could get in, even without the pit walk ticket. Despite the pushing and shoving during the signature sessions it was still pleasant enough to get a closer look at the cars (and the drivers). 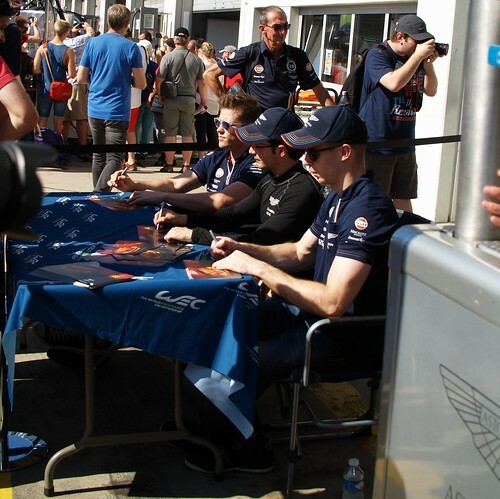 The drivers of Aston Martin #99 during the signing session. I’ve mentioned in my post about the race at Silverstone that it’s not impossible to keep up with the positions of the cars when you’re trackside. Even though I did not see any radios being sold (something they do do at Silverstone) and I could not read the listing on the enormous screen opposite the stand where I was, I still had an idea how things were going. Obviously the lights at the side of the cars help to determine who is running first, second and third in each class. And there’s the WEC app which can also be a helpful tool (unless your mobile’s battery is running out, like mine). Anyway, I think that by staying on my seat as much as possible during the race I managed to keep up pretty well. My favourite team (Aston Martin Racing, but I bet I didn’t need to remind you) wasn’t doing as well as I had hoped. Before the race I had heard about the Balance of Performance rule. To be honest, it doesn’t seem to make much sense. I’ve tried to find more information on this rule, but couldn’t find much other than that it is meant to even out the performance across a class and it’s at FIA’s discretion. That means to me that pretty much anything can happen and it did. If someone knows how to explain the fact that the slower cars (being the Astons) got hit with a BoP penalty, please do, because I don’t understand. The result was as good as disastrous. The drivers were clearly pushing as hard as they could, but the cars simply could not deliver what was needed. In case someone thinks I’m really angry about this – no, I’m not. I just don’t understand this rule and of course it does bother me my favourite team didn’t do as well as they could have done. Thankfully, in the GTE AM class the #98 still made it to a well deserved 2nd spot. For some time during the race #98 Aston Martin was running first in class. All in all I had an absolutely wonderful time. This was not only due to a nail bitingly exciting race, but also the weather and the relaxed attitude of the mainly German spectators. 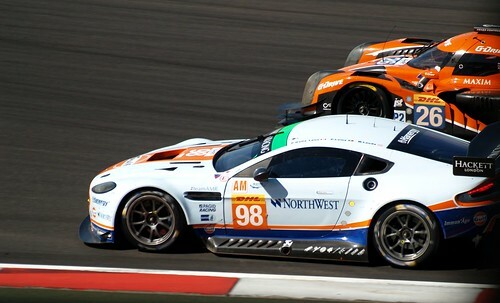 So what if you support Aston Martin Racing rather than a German brand like Porsche or Audi? We were all there for the same thing – superb racing – and we got just that. This was a weekend which resulted in a lot of smiling faces, regardless of which team the people supported. If there is another race, WEC or otherwise, at Nürburgring next year (and I know there will be! ), I am most certainly going again.